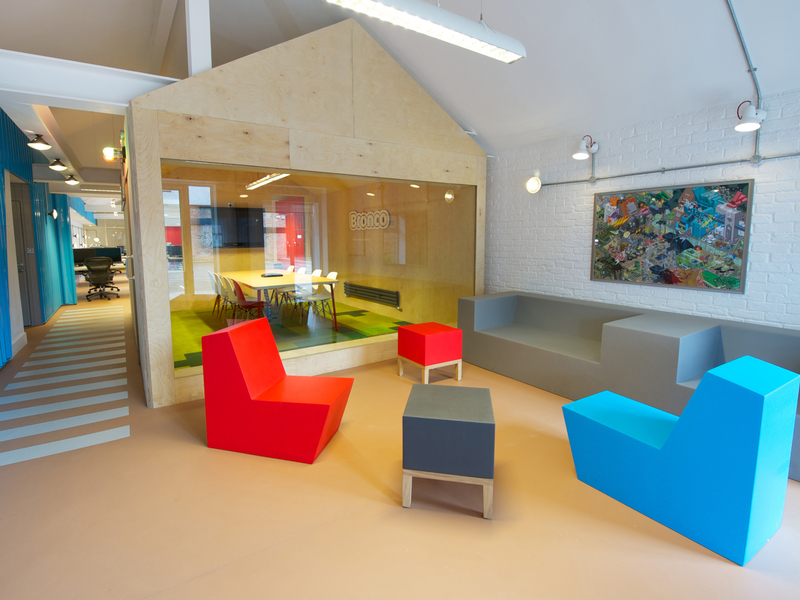 Designing this colourful, intimate workplace for digital agency Bronco in the North Yorkshire town of Ripon was more akin to designing a family home than a corporate office, says Heather Allen of design practice Phaus. Allen says Phaus was recommended for the project by Kelvin Collins, an independent marketing consultant who has worked with both Bronco and Phaus. 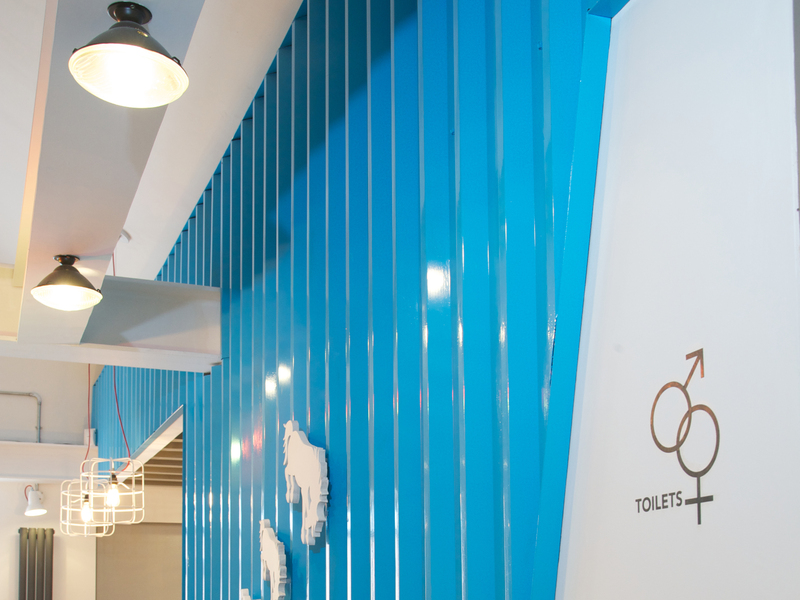 Bronco was impressed by Phaus's previous office projects and by its experience of branding and retail design, which includes projects for Footasylum and Lambretta. At first Phaus's brief was to redesign the Bronco office, which was then in an old coach house. The space had character, but Allen says it was ultimately unsuitable as a workplace for the company and the two-storey layout had created a divide in the workforce and an 'upstairs/downstairs mentality'. The company decided to move and a single-storey, long and narrow brick building adjacent to the old coach house was found that fitted Bronco's 'conservative' budget. Previously used for light industry, the new space, with its low ceilings and small rooms, needed to made to feel more 'open, light and spacious'. The first step to achieve this was to create what Allen calls 'a neutral box'. Walls were covered in a plaster brickwork-effect product by Peter Evans Studios, and then painted, while much of the floor was covered with Forbo's Touch Neutral flooring. To bring in more natural light and make the space feel more open, existing windows were extended down to floor level. which Allen says she and her team used in some unconventional ways. 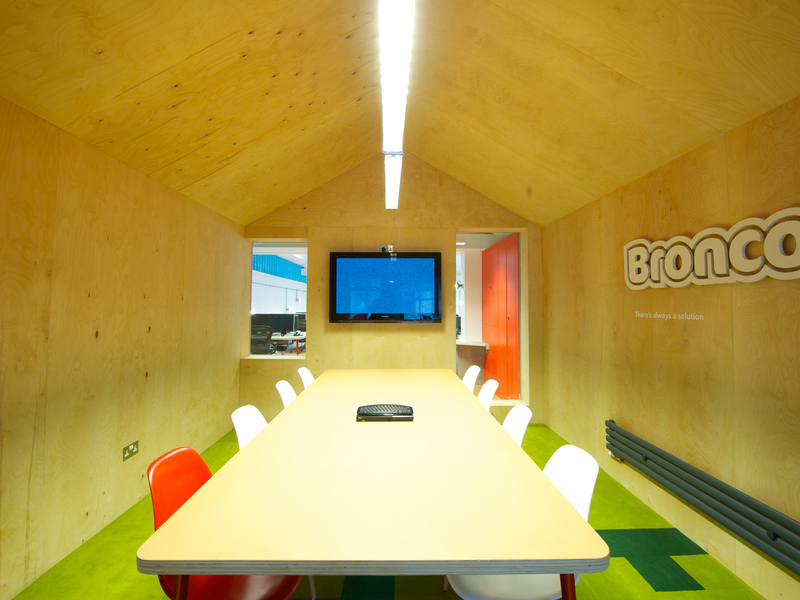 Birch-faced plywood, for example, was used to make a boardroom modelled on a garden shed as well as for timber framing in the accounts office, bespoke desks and low-level cable management. and graphic and includes warm reds, oranges, yellows and the cool cyan that features in Bronco's corporate identity. A bank of lockers used by staff is painted in assorted bright colours, and brightly coloured foam furniture from Quinze & Milan features in a breakout area. 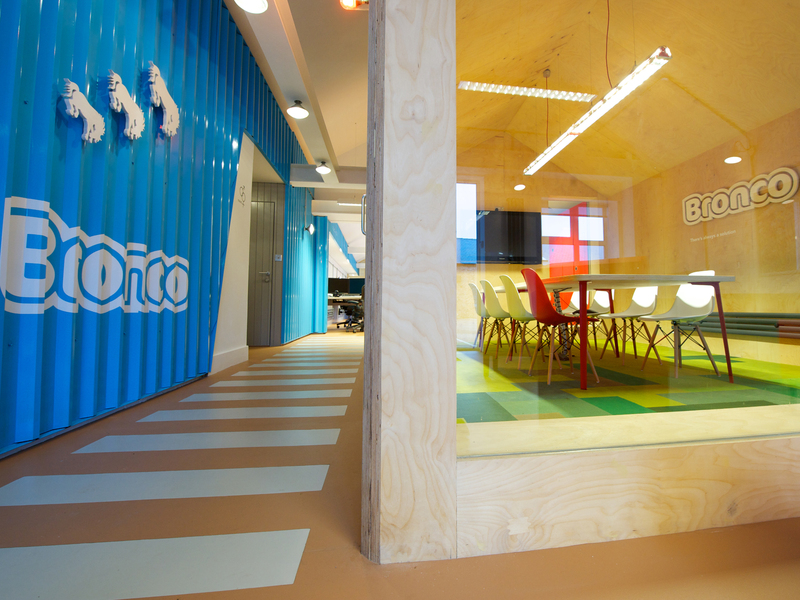 A wall of corrugated steel in Bronco's corporate colour cyan resembles a shipping container and runs the length of the building. It creates a dynamic visual link between different sections of the office and forms a 'skin' containing a core of services: the kitchen, WCs and cleaners' facilities. 'a little piece of the city in rural Yorkshire'.